For the third month in a row, the Slotland.com progressive jackpot has been hit for well over six figures bringing the total Autumn jackpot wins at the online slots and video poker site to a record-breaking $411,260. The most recent player to struck it rich at Slotland was MINE0MINE who won $134,253 playing the popular Golden 8 slot machine on October 23. Quite uncharacteristically for the jackpot with a reputation for being hit so regularly, after a big win in March ($195K) there were no big progressive jackpot winners again until a $168K hit in August. That was the start of three in a row though – big jackpot wins pretty well monthly in August, September and now October. The Golden 8 is a 9-wheel 8-payline slot machine featuring the largest slot wheels on the Internet. On the Golden 8 slot machine, the way to win the jackpot is to get three Bar symbols on any one pay line. The big jackpot pool can only be won if the player has bet the maximum three coins on that spin. The last jackpot win on Golden 8 was in May when TOPNOTCHED spun a $179,166 win. The Slotland jackpot is immediately re-set to $50,000 after a win. So many people around the world play at Slotland every day, and so many of them know it can really pay off to play the progressive, it can reach six figures again very quickly. In September, MSMIKEY won $108,060 (€78,550) playing Jacks or Better video slot. MRSSMITHS had just won $168,947 (€123,000) the month before playing the Treasure Box slot machine. Introduced just last year, Treasure Box has been lucky twice this year: TEXASTEASER won the biggest Slotland jackpot ever, $195,083 (€126,910), playing Treasure Box last March. 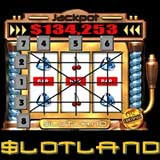 Slotland.com features twelve unique slot machines and three video poker games. Four of the most popular online slot machines and two video poker games are also available on mobile phones and PDAs. All of Slotland’s games give players the option of placing a maximum bet for a chance at the progressive jackpot. All of the slots and video poker games on the mobile network are also tied to the same jackpot pools. Slotland is available in Spanish at Es.Slotland.com.